Bodhi’s Revenge SUP Race, presented by Half-Moon Outfitters and Charleston County Park and Recreation Commission (CCPRC), comes to Folly Beach on April 22, 2012. Hot on the heels of the exciting Half-Moon Outfitters Golden Nugget SUP Race, Bodhi’s Revenge is the Charleston area’s first and only SUP surf slalom and Battle of the Paddle style event. This inaugural event, in conjunction with the East Coast Canoe & Kayak Festival, will appeal to intermediate and advanced paddlers as well as spectators. A surf-style race unique to the area, Bodhi’s Revenge will feature a slalom surf course with buoy turns in the impact zone. The intermediate route will featured one loop with a beach sprint, while the elite racers will run the route twice with two beach sprints. The event begins at 8 a.m. Proceeds from Bodhi’s Revenge SUP Race are going to the Surfrider Foundation of Charleston. This non-profit environmental organization is dedicated to the protection and enjoyment of the world's oceans, waves and beaches for all people, through conservation, activism, research and education (C.A.R.E). As the race is a World Paddle Association-sanctioned event, event organizers expect that many racers will travel great distances to take part in such a distinctive competition. Cash and prizes will total over $5000. Bodhi’s Revenge SUP Race is proudly presented by Half-Moon Outfitters and CCPRC. The race is made possible by sponsors Naish and Kialoa. 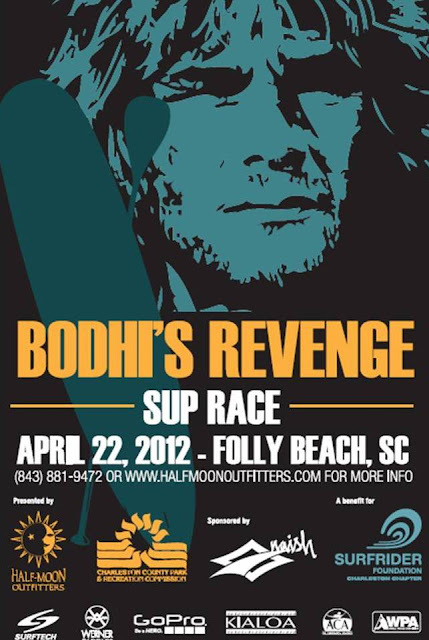 Join Half-Moon Outfitters and Charleston County Park and Recreation Commission when Bodhi’s Revenge SUP Race brings water sports adventure to Folly Beach, SC, at the Folly Beach Fishing Pier on April 22, 2012 . For race information contact Janice Fetter at Half-Moon Outfitters at (843) 881-9472 or mtpleasant@halfmoonoutfitters.com. Registration - includes one-day admission to East Coast Canoe & Kayak Festival, pint glass and Saturday night pre-party at James Island County Park. Race begins at 8:00 am starting at 2nd Street (East), Folly Beach. Boards can be dropped off there or at the County Park access in front of the pier. Parking will be available in both areas. All racers will begin at Start/Finish line. 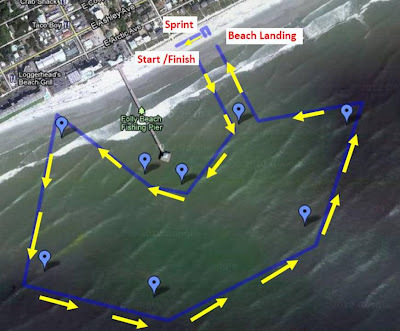 Intermediate racers will make one 2 mile loop out through the surf, around all buoys and return to shore at the Beach Landing and have a 50 yard straight beach sprint at the end to finish back at the starting line. 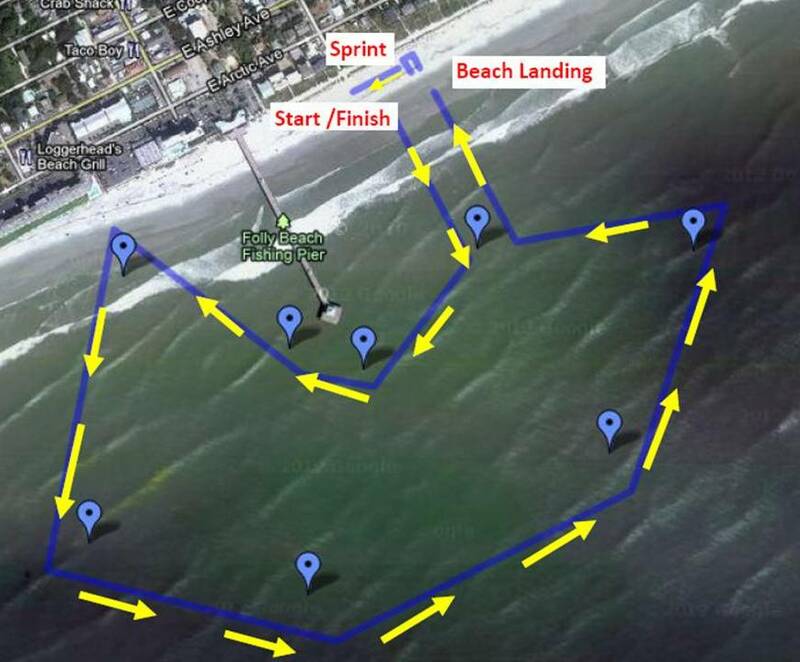 Elite racers will make two loops with one beach landing in between. They will make a 25 yard “Elite only” beach sprint through the horseshoe between loops. Board handlers will assist and racers will return to the water and repeat the 2mile course loop and will finish with the 50 yard straight beach sprint to finish at the starting line. Note: Distance of race course to pier is over 200 ft at all times. All racers are required to wear leashes and have Coast Guard approved PFDs. The course may change given conditions of the day and to provide a fun, fair and safe race.